Day 2 at #BHSOpry in Nashville was dedicated to the youngest and oldest members of the barbershop community with the day-long Junior and Senior Chorus Invitationals. Hurricane of Harmony directed by Debbie Cleveland earned the Plateau AAA Award, A CAPPELLA! directed by Sandra Zinkievich the Plateau AA Award, and Upbeat! from Lopez Early College High School in Brownsville, TX earned the Plateau A Award. Hurricane of Harmony also won the Audience Favorite Award, meaning we’ll get to see a reprise of their set during the Saturday Night Show. 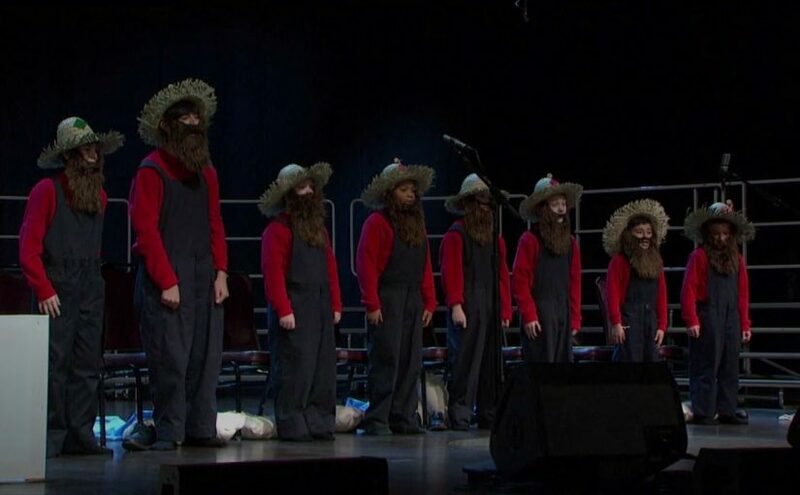 The special Presenter’s Award was given to the Wildcat Chord Ringers, a group of nine elementary and middle school students from Quinton Township School in New Jersey. The youngest performers of the day not only pulled off some great chords, but also several wardrobe changes and full theatrics that kept the audience laughing. The day also included honoring NAfME Music Educator of the Year Lori Lyford who led both her women’s chorus, Chandler High School Treblemakers and the Chandler High School Men’s Choir onto the Opry Stage. In a field of accomplished singers and longtime members, the Dixie District Seniors Chorus was named the International Seniors Chorus Festival Champion. They are led by director Jimmy Tompkins.